In our ongoing scholarship on the prerogative power of prorogation, Nick MacDonald and I submitted a column to the Ottawa Citizen defending the constitutionality and political legitimacy of McGuinty’s tactical prorogation. This study compares McGuinty’s prorogation to its most analogous antecedents: the Harper prorogation of 2009, and the Chretien prorogation of 2003. “McGuinty Has Every Right to Prorogue” complements our article from 2011, “No Discretion: On Prorogation and the Governor General,” in which we analysed and contrasted the Harper prorogation of 2008 and the Macdonald prorogation of 1873. On 15 October 2012, Premier Dalton McGuinty emerged from a late meeting of the Liberal caucus and announced his intention to resign as both Liberal leader and Premier of Ontario. He also announced that he had advised David Onley, the Lieutenant Governor, earlier that day to prorogue the 40th Legislative Assembly of Ontario to an unspecified date. Prorogation clears all bills and motions on the Order Paper, including the pending motion on the McGuinty government’s contempt of parliament. McGuinty was well within his right to prorogue as a political tactic. The move was both constitutional and legitimate. This was not an “abuse” of power, but the mere use of a tool at a first minister’s disposal. Those arguing that prorogation is unfair should turn to opposition leaders and members to remedy the situation when the legislature resumes. Responsible Government means that the First Minister and Ministers of the Crown (the Ministry) take responsibility for all acts of the Crown (policies, expenditure, and decisions), and that they be accountable to the legislature and command its confidence. In effect, the Ministry exercises the powers of the Crown where the Sovereign or Governor once did. Once the Ministry has demonstrated that it commands the confidence of the legislature, it retains that confidence until the moment that the legislature decides to withdraw it in a formal vote in the chamber. While the Ministry receives its democratic legitimacy from the legislature, it receives its powers and authorities from the Crown. As such, the Ministry still carries out all executive functions when the legislature is adjourned or prorogued. The McGuinty Ministry undoubtedly commanded the confidence of the legislature upon prorogation, and the Lieutenant Governor was constitutionally obligated to carry out McGuinty’s advice. Thankfully, no scholars have yet suggested that Lieutenant Governor Onley should have vetoed Premier McGuinty’s advice. In fact, the Lieutenant Governor’s refusal of this capital-c constitutional advice to prorogue would have amounted to the dismissal of the McGuinty Government – which would have precipitated a significant constitutional crisis. At most, a Governor may persuade the First Minister to specify the duration of the prorogation. McGuinty’s prorogation is comparable to the Chretien prorogation of 2003 and to the Harper prorogation of 2009. In each case, the Ministry unquestionably commanded the confidence of the House upon prorogation, which these First Ministers invoked as a political tactic in order to delay the work of parliamentary committees. On 12 November 2003, Prime Minister Chretien advised the Governor General to prorogue Parliament and to recall it on 12 January 2004. Officially, the prorogation accommodated the transition from the Chretien Ministry to the Martin Ministry; unofficially, it also delayed the tabling of Auditor General Shelia Fraser’s first report on the Sponsorship Scandal. After ten years at the helm, Jean Chretien resigned as Prime Minister on 11 December 2003, and Paul Martin was sworn in on 12 December 2003. On 12 January 2004, Prime Minister Martin advised the Governor General to extend the proclamation of prorogation to 2 February 2004, when Parliament finally reconvened. In total, Parliament was prorogued for 81 days. Chretien’s last prorogation thus provides the perfect framework for McGuinty’s. Harper advised the Governor General to prorogue Parliament on 29 December 2009 and to summon the next session on 3 March 2012. Officially, prorogation allowed his government to “recalibrate, consult and deliver the next stage of [its] plan.” The prorogation also allowed the Senate’s committees to be reconstituted to reflect the new Conservative majority in the upper chamber, and it delayed the work of a Commons committee on the Afghan detainee file. McGuinty’s prorogation may turn out like John A. Macdonald’s prorogation of 1873. Macdonald prorogued parliament in August 1873 in order to delay the work of a parliamentary committee that would have implicated him the Pacific Scandal. He knew that the damning content of the report would have resulted in a vote of non-confidence in his government. But Macdonald’s attempt to escape scrutiny only delayed the scrutiny. When Parliament resumed in October, the Liberal opposition and even many “loose fish” Conservative backbenchers withdrew their confidence from the Macdonald government. Macdonald resigned, and the Governor General swore in Alexander Mackenzie as his replacement. Mackenzie then advised dissolution in 1874. McGuinty’s successor will surely heed Macdonald’s example in assessing possible consequences ahead. Two elements of McGuinty’s decision to prorogue are worthy of examination: first, that no date has been set for the legislature to return; second, a rare transition from one government to another, from the same party, during a minority legislature. McGuinty indicated at his press conference that the precise duration of this prorogation will depend on the timing of the Liberals’ leadership election and the Lieutenant Governor’s appointment of the next Premier. McGuinty also stated that his successor will advise the Lieutenant Governor when to convene the 40th Legislature’s 2nd session. Given the time required for holding a convention, electing a new Liberal leader, appointing a new Premier, and making the full transition from the McGuinty Ministry to the next Ministry, the 2nd session of the Legislature will probably not begin until at least February 2013. Ontario seems to follow a different set of customs and rules at odds with the federal practice. The Legislative Assembly Act stipulates, “It is not necessary for the Lieutenant Governor in proroguing the Legislature to name a day to which it is prorogued, nor to issue a formal proclamation for a meeting of the Legislature when it is not intended that the Legislature shall meet for despatch of business.” Despite this statutory law, the Ontario Gazette did in fact publish the Lieutenant Governor’s proclamations proroguing one session and summoning the next session in March 2010, as well as in September 2005, as per Premier McGuinty’s constitutional advice. However, Premier McGuinty advised the Lieutenant Governor to issue only the proclamation of prorogation in June 2007, because the 38th Legislature was dissolved in September 2007. The Ontario Gazette that will be published on Saturday, 27 October 2012 will contain the proclamation of prorogation from 15 October and may also contain the proclamation summoning the 2nd session of the 40th Legislature. But even if it does not contain the latter, the McGuinty Government will have obeyed the law. According to the federal procedure, the resignation of a Prime Minister automatically entails the resignation of the entire Ministry. If Ontario follows this practice, McGuinty will tender both his resignation as Premier and the resignation of his entire Cabinet after the Liberals have elected their new party leader. The Lieutenant Governor will likely appoint the new Liberal leader as the next Premier of Ontario and invite him or her to form a Ministry – since the Liberals hold a plurality of the seats. In 1968, the mid-parliamentary transition between the Pearson Ministry and the 1st Trudeau Ministry also occurred in a minority parliament in which the Liberals held the plurality. In that case, Trudeau was sworn in on 20 April 1968 and advised dissolution only three days later. A new Liberal Premier could then choose from two legitimate constitutional options: he or she could summon the legislature, as Paul Martin did in 2004, or advise dissolution and fresh elections, as Trudeau did in 1968. During prorogation, neither the MPPs at Queen’s Park nor Ontarians themselves will be able to hold McGuinty to account directly. But the Liberal Party as a whole and the new Liberal leader (whoever that may be) will have to answer for the scandals of the McGuinty Government in the legislature or at the ballot box. Upon the return of the legislature, the Conservatives and New Democrats might withdraw their confidence in the government and force fresh elections. McGuinty’s prorogation raises important political questions, about what scandals his government has committed – and as the Macdonald prorogation illustrates, there may be dire consequences for his actions. But his use of prorogation conforms to the legal-constitutional standards of Ontario and Canada. One may debate the desirability of the current laws and constitutional conventions surrounding prorogation, but not their current legitimacy. Prorogation is a political tool in the toolkit of Canadian First Ministers, not an “abuse of power.” The legislature will decide whether or not to limit its use or to remove it altogether. Mr. David Kahn of Ottawa, Ontario provided some comments to the column “McGuinty Has Every Right to Prorogue.” I responded to him on the Citizen‘s website and have reproduced the exchange here. “Your headline is factually wrong. Only the Lieutenant Governor has the right to prorogue. The Premier has the right to advise the LG to prorogue. As the Premier also tendered his resignation, the LG also has the responsibility to find a replacement. In this minority government situation, the LG should have consulted with the opposition leaders prior to making any decisions. “At the risk of turning this thread into something resembling an American presidential debate, where statements about being factually incorrect come from two contrary positions, I would still submit the following as a response to your objection to the Citizen’s headline. 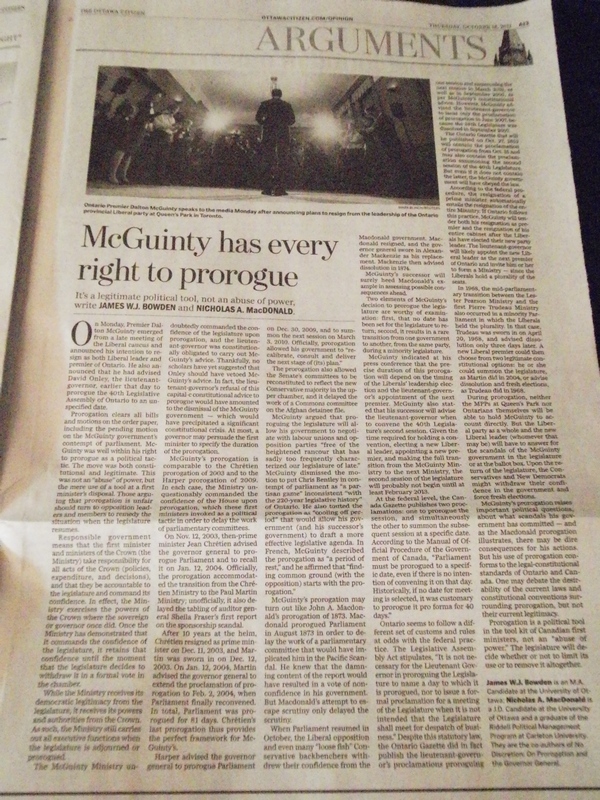 First, I would like to point that that Nick and I did not choose the headline; we originally submitted “McGuinty’s Prorogation: Constitutionally Sound but with Political Consequences.” (It’s standard practice in virtually all serious newspapers that the selection of the headline is the editor’s prerogative, and I accept the legitimacy of this custom). Second, our constitution consists of co-equal written and conventional elements, which we could broadly call the “formal” and “informal”, respectively. (I derive these terms from Mansfield and Baker). Formally, the written constitution indicates that the Governors summon, prorogue and dissolve the legislature. (Ironically, the Constitution Acts does not actually mention the power to prorogue, and it only mentions the powers to summon and dissolve parliament! But we derive prorogation from summoning in this case.) Informally and conventionally, the First Minister makes the political decision to prorogue because under our system of Responsible Government, the Ministry — not the Governor or Queen — must take responsibility for all acts of the Crown. That said, the more accurate shorthand is actually to say that McGuinty prorogued — because the *decision* to prorogue was his. And that’s the real issue. I therefore support the Citizen’s headline. Fourth, your follow up comment is correct: as Nick and I wrote, Dalton McGuinty announced his intention to resign in the near future, but he will not formally tender his resignation to the Lieutenant Governor until after the Liberals have elected their new party leader. Fifth, as to the consultations with opposition leaders, I’m not sure what that would accomplish. Obviously, the Conservatives and New Democrats will not form a coalition in order to topple the Liberals. The New Democrats wouldn’t even support the Conservatives as a single-party minority government. Under the circumstances, there is reason why the Lieutenant Governor would or should consult with the opposition. This entry was posted in Constitution (Conventional), Crown (Powers and Office), Prime Minister's Powers, Prorogation, Reaffirmation of, Responsible Government and tagged Dalton McGuinty, Nicholas A. MacDonald, prorogation. Bookmark the permalink.